Before getting to the fine instrumentals on Do You Hear?, let's talk about the cover art. Guitarist Eric Loy presents his back side on the front, and he is popping out of an ice hole with skaters performing behind him on the flip side. You never see Loy's face, but you definitely know that the fellow has a unique sense of humor and an inspired creative streak. I like that. Loy also has unique talents on the guitar, and those shine here. The album mixes his solo fingerstyle efforts with rocked-out, electric excitement as part of a trio (with Curt Duncan on bass and Chris Sievers on drums). Most of the album, though, features Loy flying solo, and his fingers really fly! Having reviewed quite a few low-key guitar instrumentals over the years, it's nice to get my hands on something freshly different like this. Loy employs an edgy improvisational style that cuts across jazz, blues, country and rock in satisfying and eye-opening ways. The trio presents the three longest tracks, combining for more than 15 minutes of music. These jazz/rock blends showcase Loy on the electric guitar, and he is just as proficient plugged-in as unplugged. Interestingly, the most rocked-out numbers are the usually understated O Little Town of Bethlehem and Silent Night. On the former, Loy's formidable guitar licks are somewhat concealed by the percussion and bass, and the latter exudes an acid, heavy metal edge. My favorite tracks tend towards Loy's solo efforts; for example, his brightly exuberant Joy to the World speaks straight to the heart. Nice. 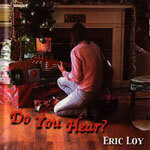 Eric Loy's Do You Hear is a guitar-centric option for the holidays that combines acoustic fingerstyle with frenzied electric, and that disparate blend may be just your cup of tea.